It’s that time of year again! You know what I’m talking about: Rudolph with his nose so bright; Folks dressed up like Eskimos; and Jack Frost nipping (hopefully a sip or two of vino). Yes siree, I’m ready and raring to get my Yuletide on. So, in the spirit of the Season, I’m going to provide you with some red and white wine recommendations for your holiday gift giving because I believe in the old saying: “Tis better to give than receive. ” This is even better if the giver and receiver is you (or if the recipient is someone who is willing to share). And depending on your budget, the sky is truly the limit when it comes to finding a wine to give that special person. Shopping for wine any time is a labor of love, but during the holidays it is a lot more fun because wine shop shelves are chock full of a wide and varied selection of vinous products. The great thing about the holidays – especially Christmas – is that we also have a perfect opportunity to choose wines that pair well with the cornucopia of special foods we’ll be eating. Following that theme, I have selected for your consideration a list of wines below that would make great gifts, and also be excellent accompaniments to some of the more traditional holiday foods we will be enjoying over the next few weeks. So here we go. For the celebratory sparkling wine aperitif: Taittinger Comptes De Champagne Rose; Nicholas Feuillatte “Blue Label” Brut Champagne; Mumm Napa Cuvee (sparkling); Paul Bara Brut Champagne; Segura Viudas Reserva Cava; Veuve Cliquot Brut Champagne; Roderer Estate Anderson Valley Sparkling Wine; Krug Grande Cuvee Brut; Perrier Jouet Grand Brut; Iron Horse Russian Cuvee (sparkling). 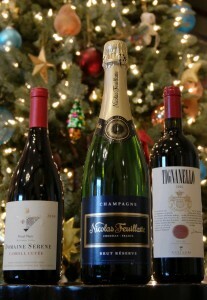 For the traditional Christmas Eve Feast of the Seven Fishes, you might search out these lovely bottles: Tenuta Sant’ Antonio Scaia Garganega; d’Arenberg The Hermit Crab Marsanne-Viognier Blend; St, Supery Sauvignon Blanc; Falcor Chardonnay; Castello Banfi Principessa Gavi; Montinore Estate Riesling; L’Ecole 41 Semillon; Cakebread Chardonnay; Beringer Private Reserve Chardonnay; and Talley Arroyo Grande Vineyard Chardonnay. 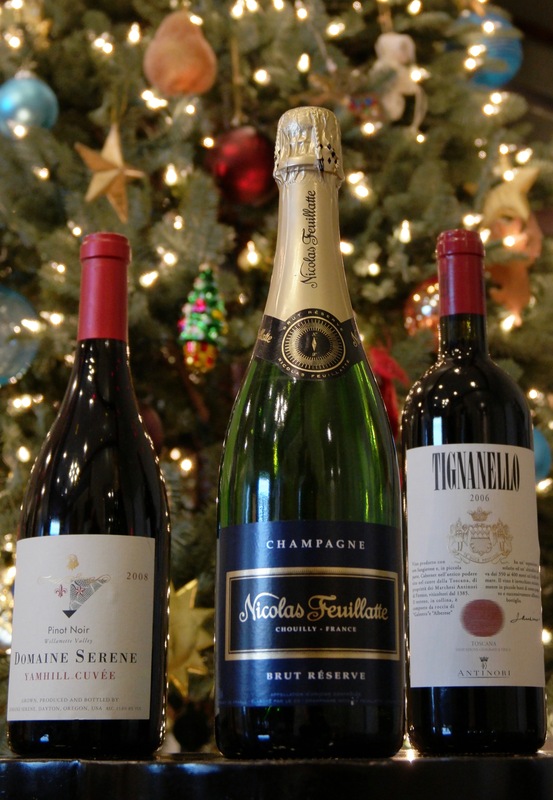 For Christmas Ham or Turkey: Newton Claret; Domaine Serene Yamhill Cuvee Pinot Noir; Banfi Brunello Di Montalcino; Marques de Caceras Rioja Reserva; Chapoutier Bila-Haut Cotes Du Roussillon; Ferraton Tavel Rose’; Easton Amador County Zinfandel; Raptor Ridge Atticus Vineyard Pinot Noir; and Michele Chiarlo Barbera d’Asti. Have a great holiday season, a very Merry Christmas and a Happy New Year!